Rhode Island Democrats might finally have the votes to get the Reproductive Health Care Act to the governor’s desk in 2019. Rhode Island has a powerful anti-choice lobby, and anti-choice Democrats who have routinely blocked the bill in recent years. A new pro-choice legislative majority and a governor committed to signing abortion protections into state law has many in Rhode Island hopeful about finally passing the Reproductive Health Care Act (RHCA) this year. “I’ve never been more optimistic,” Ajello told Rewire.News. Rallying legislative support for the pro-choice measure in the most Catholic state in the United States has been difficult. Rhode Island has a powerful anti-choice lobby, and anti-choice Democrats have blocked the bill in recent years. Rhode Island scored an “F” grade from NARAL Pro-Choice America in 2016 for its “severely restricted access” to reproductive rights. The 2018 midterms changed the balance, adding more women and pro-choice legislators in the Rhode Island General Assembly than ever before. This includes newly elected state Reps. Karen Alzate (D-Pawtucket), Terri Cortvriend (D-Portsmouth), Justine Caldwell (D-East Greenwich), and Mario Mendez (D-Johnston, Providence) who replaced incumbents opposed to the RHCA and are not co-sponsoring the bill, Ajello said. There are four new Rhode Island state senators who back the RHCA who replaced opponents of the bill. In the state senate, the bill has 17 sponsors—five more than 2018—so there is “huge momentum,” said sponsor state Sen. Gayle Goldin (D-Providence) who expects to secure more support. The bill would need 19 votes to pass the state senate. Gov. Gina Raimondo (D), who will deliver her State of the State address Tuesday night, is advocating for the RHCA and is “fully committed to enshrining the protections of Roe v. Wade into state law,” spokesperson Josh Block confirmed Monday. 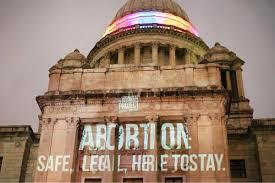 Raimondo has not been as vocal a pro-choice ally in past years. “This is a great indicator of the governor really serving as a voice for the 71 percent of Rhode Islanders who want to see this bill pass,” Goldin said. Legislators expect to introduce the new bills next Tuesday, on the 46th anniversary of the landmark Roe decision. Advocates have ramped up efforts pushing for the RHCA. “The Reproductive Health Care Act is not about politics: it’s about our health and our ability to control our own futures. The governor has been a leader in working to close gaps in access to reproductive healthcare. The passage of this bill would continue that important and powerful legacy by making sure that we are a state where we protect the right to access safe, legal abortion care,” Jordan Hevenor, co-director of The Womxn Project, said in a statement. Advocates said the governor’s backing should be a clear signal to anti-choice Democratic leaders like the Speaker of the House Nicholas Mattiello (D-Cranston) and the Senate President Dominick Ruggerio, who have held up the RHCA. Neither responded to Rewire.News emails for comment. But Ajello is hopeful Mattiello may bring the bill to a floor vote for the first time given his recent comments about the public support for abortion rights protections. “I think that’s in recognition of poll results showing such a strong support and a strong feeling of the need to do this,” she said. As the anti-choice Trump administration and a more conservative U.S. Supreme Court continue to threaten reproductive rights, there are many voices advocating for the RHCA this session.